Greetings my fellow gamers and inhabitants of this here Internet! My name’s Cary, and welcome to my personal gaming blog. I live in New Jersey with my wonderful husband and an adorable/moody/asthmatic cat. I mostly work as an archivist at an historical society, but I’m also a gamer and game blogger…and a food preparer, financial consultant, housekeeper, knitter, gardener, et cetera, et cetera, et cetera. I’ve enjoyed console and computer games for a good three decades now, and I don’t plan to stop enjoying them anytime soon, though I don’t have as much time to play as I used to. I’ve played a lot of games, but my experience is nowhere near the levels of some. I play games that I’m drawn to, not every single game that comes along. Notable games that I haven’t yet played, or might never play: Contra, any Zelda game before the Ocarina of Time, almost any Sonic game, the Ratchet and Clank series, just about any war game or survival horror game, Gears of War, God of War, Halo, and plenty of others. Lots of great games will surely continue to slip under my radar, but that’s okay. I keep up with games and gaming news as best I can, but I’m not a marathoner or a completionist or super competitive…I just enjoy playing. This blog serves as my platform to discuss, albeit sometimes incoherently, the games that I have played and am playing, as well as talk about other enjoyable things like music and…um…music…and, well, general life happenings. And maybe I’ll offer the occasional rant when the mood strikes. I hope you’ll enjoy my stories, and I’d love to hear yours. This is my cat trying to sit on a rainbow. Kitty is guarding the pot of gold. As far as he’s concerning, he IS the pot of gold! Hey, just wanted to say thanks for the follow! Have a frickin awesome day! Hi Cary, (this is Maya from VVG btw – I wrote that piece you reblogged about couples and videogames) – and I’ve just read your about page: you’re an archivist?! That’s so cool – I’m working in an archive at the moment for my PhD. As much as I enjoy some parts of archive work, it is also one of the reasons I have been playing so many games 🙂 Really enjoy your blog, btw! It is indeed history related! I think they call it cultural history these days… I’m researching mid-century radio – specifically a literary programme that aired for a few years at the BBC. I’m also writing about archives – which means having to read heavy theory stuff like Derrida’s archive fever. After a hard day reading there is nothing like spacing out in front of a screen! Hello “another gamer!” 🙂 Thanks for the kind words. It’s great hearing from you as well. I am following LTG, but you’ll have to forgive my lack of interaction there. Life is what it is, y’know? It’s all I can do to keep up with my writing projects, and I’ve fallen waaaaay behind on blog reading. But it’s good to know you’re doing well. It seems like forever ago that we were young and dumb bloggers just getting started. What a ride it’s been since! Thanks for dropping by and I’ll endeavor to get over to LTG soon. Hello Recollections of Play. I don’t follow you on this blog, but on another little online platform of mine…anyhow, I recently nominated you for the Blog of the Year Award. Congratulations! http://wp.me/p24LWs-co Have a pleasant day! Where did you get that great star logo? Believe it or not, I made it! It’s pretty much the pinnacle of my nonexistent graphic design skills. I like your blog design and your posts, so I nominated you for the WordPress Family Award. I gotta say, I envy the fact that you’re not a completionist or super competitive. I’m definitely both. Being a completionist can and definitely does get in the way of enjoying a game sometimes! I’ve had my completionist moments, most recently with Mass Effect, but they’re pretty few and far between. Sometimes though, I’m envious of the completionists! There are certainly games where I I wish I had had the time to really find every last secret. But I try to enjoy whatever time have with games, even if its just a few hours from start to finish. I have nominated you for a couple of awards! Please click http://wp.me/p3EVe2-3w for your award logos! Thank you for the link! My plate’s really full right now, but I’ll make note to head over to the site soon. Sounds interesting! Hello, the Duck has nominated you for the Liebster Blog Award! A nice blog and concept you have here! I’m looking to give my blog a video game style theme and your blog has given me a bit of inspiration. By the way, can you recommend me any other video game blogs towards retro and modern games? Thanks for the kind words! Any of the blogs I have listed on the right sidebar under “More for Your Eyes” are great places to start for gaming knowledge in general. A few good retro game sites that I know of are Retro Gamer (blog.retrogamer.net), Retro Video Gaming (retro-video-gaming.com), Gamemories (http://gamemories.wordpress.com/), and Gaming After 40 (gamingafter40.blogspot.com). Good luck with your own blog! Thanks a lot! I’ll check them out soon! This is a bit off-topic, but that is a damn cute cat. Also, awesome blog! Thanks much! That’s my cat’s happy face, by the way. Ha! Haha, well thank you! You’ve got a pretty nice blog yourself over there — lots of wonderful memories! 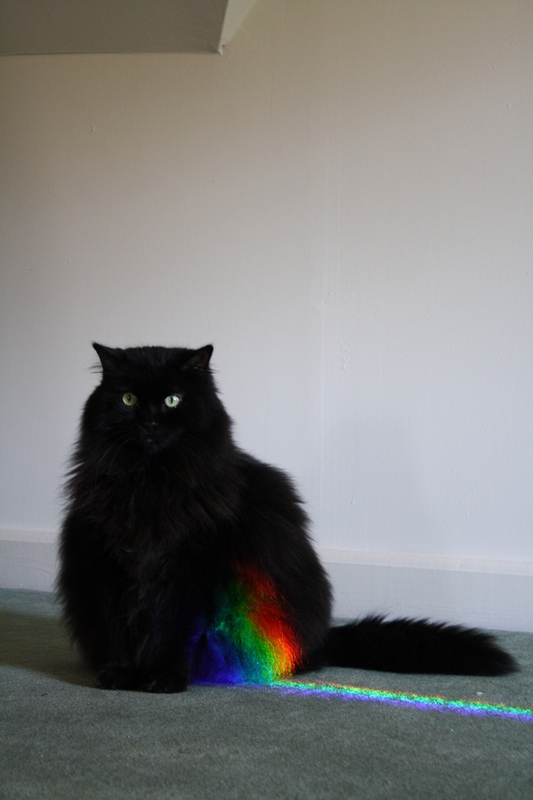 2) You have a cat that sat on a rainbow. It no longer matters what your blog says now, then or in the future, you now have a reader for LIFE. 1) Hmmm…interesting. I don’t know any space animals. Being stalked by one might not be so bad, but let’s see how things go. 2) I think giraffes are pretty cool, so it’s a win-win! They are indeed. A similar thanks for following my bl0g! Gasp! no R&C?? I can understand not playing the others, but.. my goodness. Thank you for following my blog, I look forwards to reading through yours! What I have read so far has been great though 🙂 Keep it up! My thanks to you as well for following! I’m always excited to find a new blog to read and you have some great posts. Happy writing! I was at a loss as to which post I should comment on without spamming your blog! Great posts and fantastic ideas! Game on! Thanks much! I’m glad to have come across your blog and look forward to reading it. Thanks and I look forward to reading your stories as well! I can’t believe I waited this long to share, and I’m so glad to know there’s a great community of gamer-bloggers out there. Hello. It’s fun to have found another good blog on video games. They are hard to come by. I like gaming, too. It is awesome. Greetings! I’ve been searching the webs for other game-related blogs and was happy to stumble across yours as well. They are few and far between.